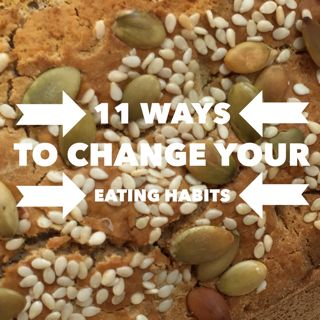 11 Ways to Change Eating Habits. Gosh! I just realised that I missed my 2 year anniversary of launching this blog by 17 days! Weep! So to celebrate that day, I revisited my first post. The title was How Do I Change My Eating Habits? Today, I’m updating it here, with a few ideas for you! Change one thing every week and in a year you’ll have made 52 changes. Wow! Change your choice of sugar to an unrefined option. Perhaps Rice Syrup (not a fructose), Stevia or Palm Sugar. Reduce the volume of caffeine you add to your diet. You can opt for herbal/fruit teas. Acidic fruit teas can damage tooth enamel, so herbal are preferable as regular choices. Try Ayurvedic teas, Mint, chamomile, Ginger and Turmeric, Rosehip, liquorice, Dandelion Root. Choose whole foods, rather than white ones. When foods are bleached, most of the nutrients have been stripped out and often, colour is added back in. My old favourite comfort dish from many years ago … wheat penne pasta, egg, mushroom, cow’s butter, cow’s cheese. New Version: Exchange wheat for rice penne or veg pasta, keep the eggs and mushrooms, exchange the cow’s cheese/butter for goat/sheep products .. DONE! Just as good to eat! If you decide cow’s products are for you – I don’t use them for my own food or on this blog – choose organic, grass-fed. Factory farmed cows are given antibiotics and hormones. If you’re curious to see unhealthy images of distorted udders, search on Google for images/stories about factory farming. Start reading labels. Change just ONE product you buy each week. If you’re unsure about an ingredient – or if the product is created in a healthy way (often chemicals are used during refinement/production and they’re not listed on labels) call the manufacturer. One call could help you to choose an item you can then buy on a long-term basis. Eat more regularly, or eat less at a meal, if this is an issue you need to address. Make one meal/snack from scratch. A quick stir fry with a good fat and some veg with protein/carb, whatever you need at that meal. Freeze a batch snack/meal so you have something you can grab on the go. Commit to finding a food that will replace shop bought chocolate. Or change your brand of chocolate to one with the highest volume of chocolate possible and the least sugar content. Make time for yourself to look at how you’re eating. This is a biggie. Time is precious but we often give ourselves the least time of all. Make something Fermented!! If we look at the basics, it’s often only when we face a mini or major health crisis that we look to make minor or radical changes to the way we eat. Why not now? Expect to meet with resistance along the way. Not everyone will automatically find it easy to deal with the choices you make. What are YOU going to change this week? !